The walls between us seem impenetrable. We live in an age of strife and division. Factors such as race, class, values and lifestyles keep us from connecting with others in meaningful ways. It’s easy to avoid or ignore those who make us uncomfortable and those we simply do not like, but God’s call to the church is to do just the opposite. Leroy Barber has spent decades pursuing reconciliation and justice amongst groups of vastly diverse people. He knows the challenge of embracing those who are difficult to embrace, yet he advocates that the way to radical shalom on earth is through pursuing these relationships. We have the opportunity as the people of God to bring true peace and unity to a world that desperately needs it. Embrace the challenge to show a divided world the bridge-building power of God’s love. "Leroy Barber has been on the frontlines of the struggle for racial justice for many years now. In his new book Embrace, he makes the case for why deeper and more loving relationships, especially with people who are unlike us, hold the key to creating God's kingdom here on earth and repairing the breaches in our lives and societies. Leroy's book employs powerful personal examples, accessible prose, insightful social analysis, and a mastery of Scripture that together make this a must-read for anyone who is concerned with our future together as a human family in a broken world so loved by God. He shows that talk isn't enough―that we need to repair the breaches we have caused and allowed in both our relationships and our systems. Leroy Barber is making a powerful case today for why leaders of color need our strongest affirmation and support, especially in faith-based and other critical nonprofit organizations, if we are to move forward." "Troubled times require God's people to rise up and embody God's shalom. Leroy Barber fully understands the world we live in. His life and ministry reveal a deep concern for our divided and broken world. He not only writes about shalom relationships but also demonstrates them in his own life and ministry. This book will lead you through important but sometimes difficult concepts and issues that can strengthen the church and direct you toward an embodied life of godly relationships that we will do well to emulate." "In Embrace Leroy Barber shows us that loving our neighbor includes knowing and relating to one another. With years of wisdom and experience, Leroy beautifully and patiently shows us how we can become the beloved community we were created to be. If you're looking for a practical and hopeful book to help you navigate some of the deep divides that plague our culture, look no further. This book is insightful, encouraging, and a delight to read!" "Through Embrace, Leroy gives us a lens through which to view both the challenges and opportunities for people of faith building community through nurturing relationships. His storytelling approach shows us the importance of empathy, compassion, and having a desire to learn by listening to the journeys of those who are not like us. 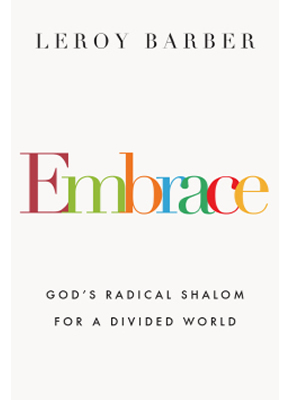 Embrace is a practical road map for radically living into God's shalom in a divided world. With over thirty years of experience in building community both domestically and internationally, there is no better person than Leroy Barber to show us the power of living into God's embrace of diversity."